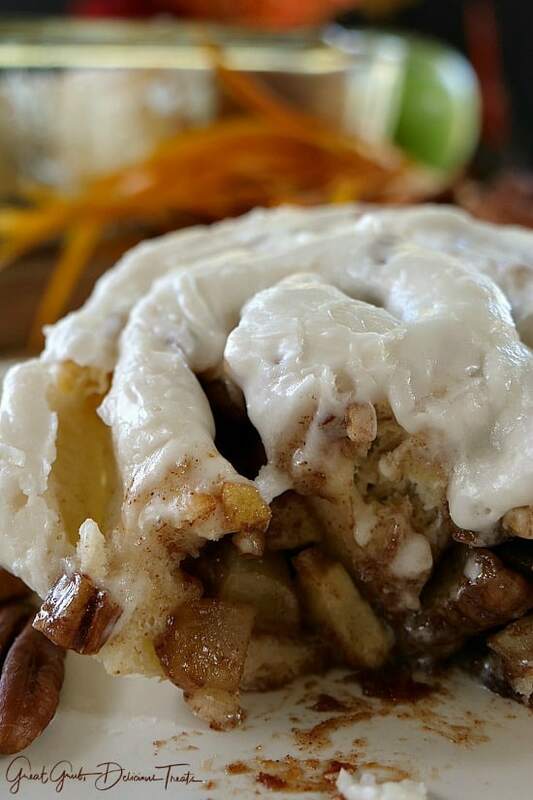 These homemade apple pecan cinnamon rolls are sweet, sticky and loaded with bits of apples and pecans in every bite. 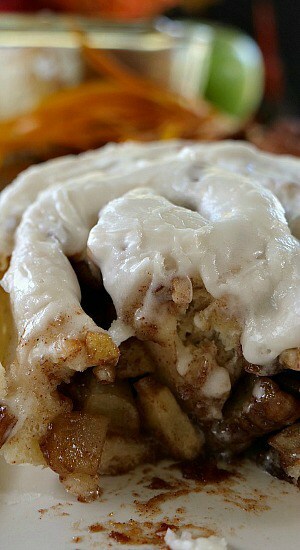 Each cinnamon roll is also loaded with a delicious icing that melts it’s way into the crevasses of each roll. 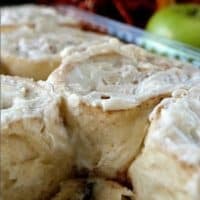 These delicious cinnamon rolls take the standard cinnamon rolls to a whole new level with the addition of this delicious filling. Hot, sweet and sticky! 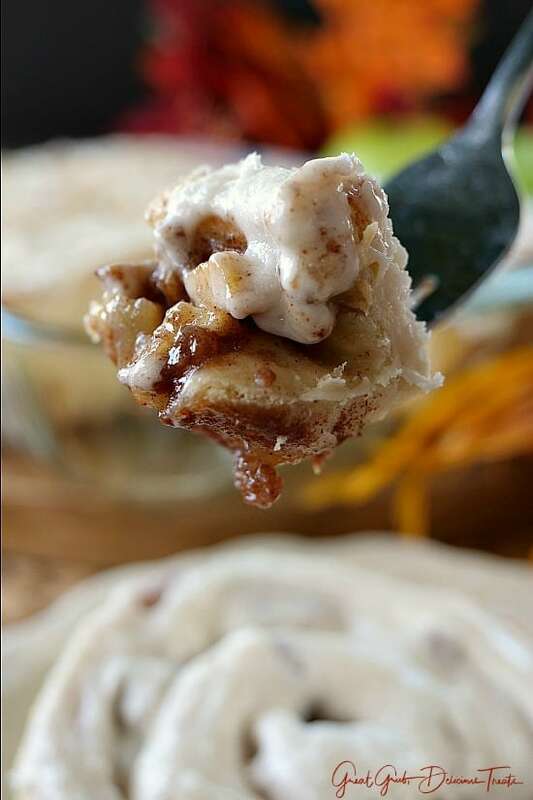 With fall right around the corner, what better dessert to make then these homemade apple pecan cinnamon rolls. SO YUMMY! Just look at these babies! So full of deliciousness. With every bite there are apple bits, pecans and amazing cinnamon flavor. I’m in love, love, love with this recipe and you will love this recipe too! 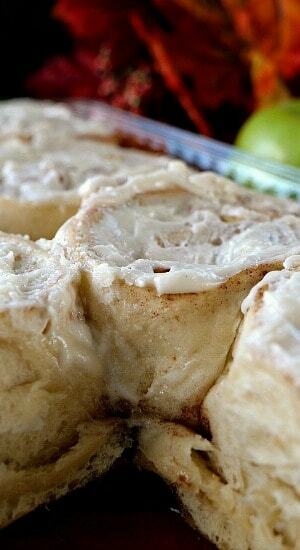 Cinnamon rolls are always a favorite and these will definitely satisfy your sweet tooth. 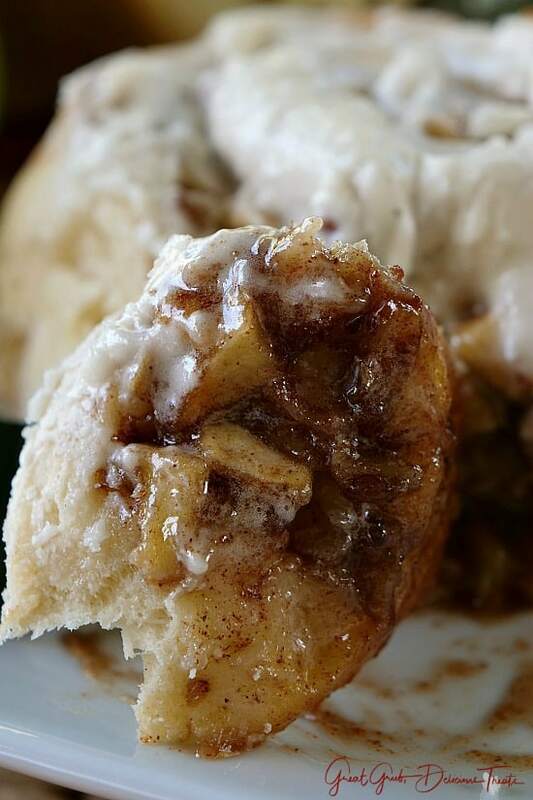 So, if you love cinnamon rolls, and you love apples and pecans, then this is definitely right up your alley. These are time consuming to make but are so worth every minute. Basically, make the dough and let it rise. Next, roll the dough out and add the delicious apple filling, roll up, cut into 2″ pieces and place in a 9 x 13 baking dish. 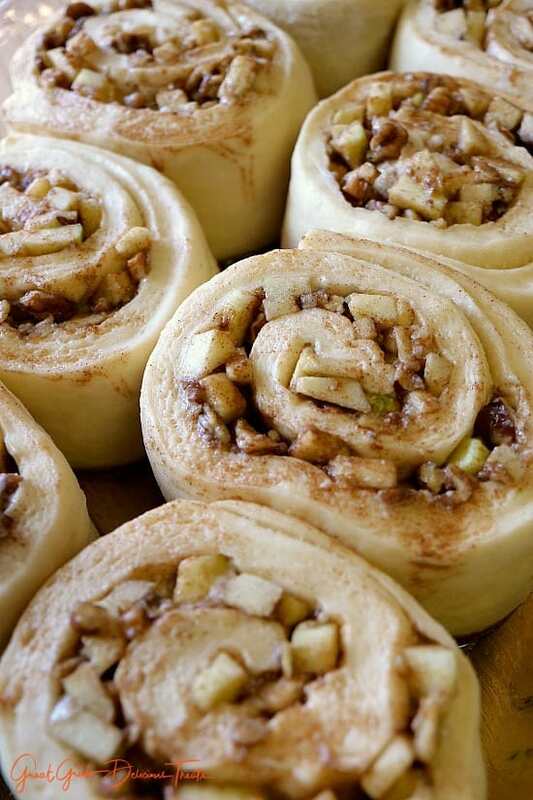 Let the dough rise again, pop the homemade apple pecan cinnamon rolls in the oven and bake until done. Once they have finished baking, add 1/2 of the icing immediately so it melts and really get into all the crevasses, and then after a couple more minutes, add the remaining icing. Lastly, enjoy! This recipe comes from my friend, Nancy, over at Baking Blond. 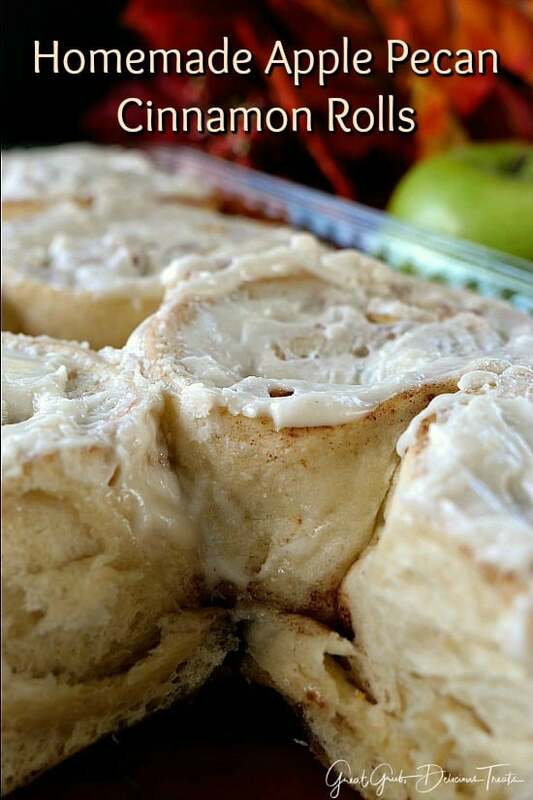 Ever since she posted her apple orchard cinnamon rolls on her blog, I’ve wanted to make them. I craved them and decided I just had to make them myself. Well, I have made these cinnamon rolls 4 different times, 3 of which were in the same week, and each time I’m more in love with this recipe. The only thing I really did differently was add pecans. These are so delicious and you are going to love these just as much as we do. Make sure to check out all her recipes. 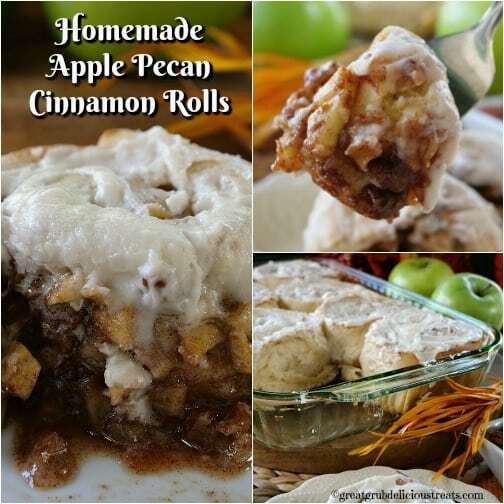 Try these homemade apple pecan cinnamon rolls today! Here are a few more delicious apple recipes on the blog: Apple Pea Walnut Crisp, Apple Pecan Fritter Bites and Apple Pecan Monkey Bread. When ready to bake, preheat oven to 350° and grease a 9 x 13 baking dish. In a small saucepan, heat milk and butter until butter has melted. Remove from heat, let cool a bit. With a stand mixer, mix together water, yeast, sugar, eggs and yokes with a paddle attachment on low speed until mixed well. Add salt, warm milk mixture, 2 cups flour and mix for 1 minute on medium speed. Change to a dough hook and gently add another 2 cups of flour and if needed, add remaining 2 tablespoons of flour. "You want the dough to clean the sides of the bowl but there should be about a 2 inch wide layer of dough still at the bottom." Knead for 10 minutes until dough is soft, smooth and elastic. Place the dough onto a lightly floured surface and form into a smooth ball. Then place dough into a greased bowl. Turn over making sure the grease is on the top and bottom. Cover with plastic wrap and place in a warm place for 1 1/2 to 2 hours so the dough will rise. The dough should double within that time. Start preparing the apple pecan filling approximately 15 minutes prior to the end of the rise time. Peel, core and slice apples into 1/4" slices. Then chop apples into small pieces all about the same size. Put into a medium mixing bowl, add lemon juice and stir. In a small mixing bowl, whisk brown sugar, cinnamon, salt and flour together. Sprinkle over apples and stir to coat. Add chopped pecans and toss until mixed. Once dough has doubled in size, place onto a lightly floured surface. With a rolling pin, roll into a 16 x 12 inch rectangle. Spread butter over entire surface except for the edge of one the long side (16 inch side). That will need to be left clean of apples and butter so it will stick to the dough to seal. Sprinkle the apple pecan mixture on top of the butter. Begin rolling the dough as tight as possible lengthwise, the 16 inch side. Pinch the ends together as you roll making sure the filling stays inside. Once it's rolled, moisten the clean edge with water and seal. Make sure the roll is 16 inches long. Cut into 2 inch slices. Should end up with 8 pieces. Place into a greased 9 x 13 baking dish, cut side up and cover with plastic wrap and set in a warm place. Let rise. Bake cinnamon rolls for about 35 minutes until internal temperature reaches 185-188° and rolls are golden. In a medium mixing bowl, beat butter and sugar until creamy. Add vanilla and milk and beat until well incorporated. Add additional milk if needed to make the icing easy to spread. When cinnamon rolls are finished baking, remove from oven. Spread rolls with half of the icing immediately allowing the icing to melt and really get into the crevasses. After about 3 - 5 more minutes, spread the remaining frosting over the cinnamon rolls again and enjoy! Hi, I was wondering is the icing really sweet or is it more on the buttery side?